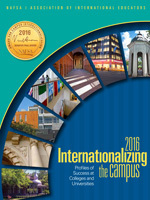 Each year institutions that win Simon Awards are profiled in NAFSA’s Internationalizing the Campus: Profiles of Success at Colleges and Universities, a report on international education in the United States. In the months following the selection of winners, NAFSA sends a journalist to the selected institutions to gather information for the report, learning firsthand about exemplary practices, model approaches, and major trends in internationalization on each campus. Internationalizing the Campus presents an agenda for action, contributing to the dialogue about the development of a strong U.S. international education policy, one of NAFSA's strategic goals. The case studies and campus models highlight not only sound educational practice but also the value to society that derives from effective international education. Designed as a tool for campus-based international educators to share with their institution's top leadership—and perhaps their trustees— Internationalizing the Campus documents and underscores the value of international education for audiences including NAFSA members and the international education community at large, national and international opinion leaders, policymakers, the media, and business and industry. 2005 Report — Printed copies are no longer available. 2003 Report — Printed copies are no longer available.